One of the most important ways of getting a beautiful makeup look in reality is to have good skin. Do you wonder why your friend uses the same face powder as you but hers looks way better? It's most likely because you have pimples and acne. I have been against pimples and acne almost all my life and it has been going very well for me. Unfortunately, yesterday I ate groundnuts and woke up with a big fat pimple on my face :(. Anyways i'v decided to give a few tips on how to avoid and get rid of pimples and acne for good! Foods and drinks that could cause pimples and acne include: Fat and junk foods, Alcohol, dairy foods, soda, coffee, spicy foods and meat. You should look into your diet and find out which of these foods and drinks you might have been taking frequently. Sometimes it could be one particular food or drink that cause these breakouts. I realized a few years back that whenever I took groundnuts i'd wake up with a pimple the next day:(. Also, my sister noticed that anytime she took whole milk she would get cystic acne. It actually took her months to realize whole milk was the cause of all the acne. Luckily for me, for a long time now, I haven't been a fan of coffee, spicy foods and alcohol. I took more junk and dairy foods when I was in uni but now that i'm done, it's not a major part of my diet anymore. yaaay! Activities related to pimples and acne such as stress or hormonal changes are usually out of our control but could be managed through sleeping more, drinking more water, exfoliating, washing your makeup brushes and cleansing your skin (can't have those pesky bacteria forming a pimple colony on our precious skin). 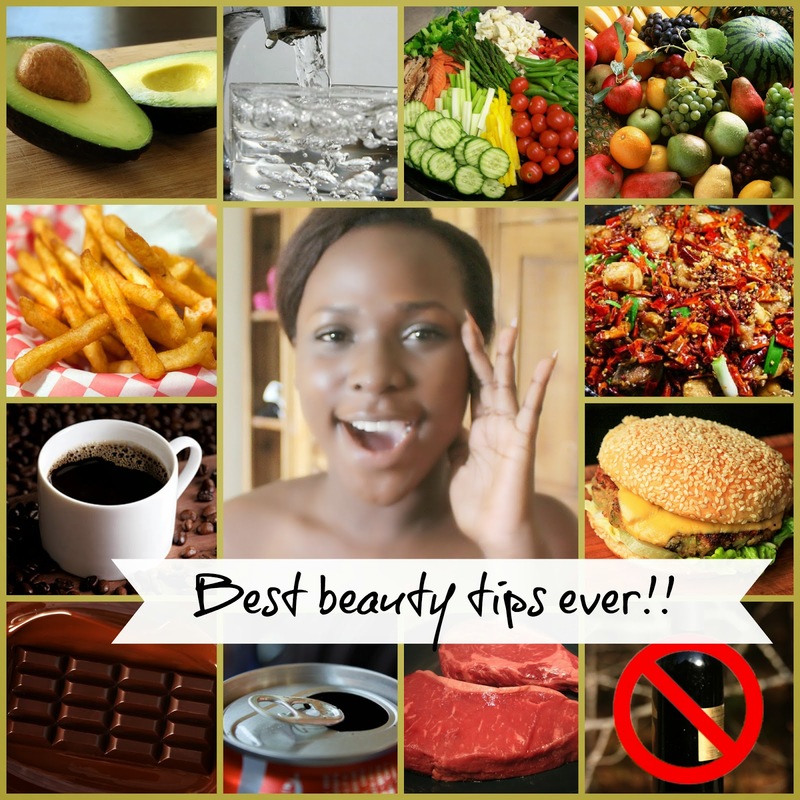 Foods and drinks for better skin include: Avocado, Fruits, vegetables and lots of water! Luckily for me again, i'm a living water storage tank so I never have "water-drinking problems". I'm also a fruit consuming machine. When my parents buy fruits in the house, they hide it from me because they know it would disappear almost immediately. Even though I always find it :D. So, avoiding pimples and acne isn't so hard for me. Now, its time to suit up and win this war against ugly pimples and acne because we want our makeup to look flawless! Even more than Yonce hehehe. I hope this post helped you in some way. This works for me and i'm definitely sure it would work for you! Please share this post and let your friends benefit from it too! Awwwwww thanks for this post dear, I always try to make my face look pretty even with the whole make up thingy I got but pimple wouldn't let me rest people say to me you look good but your face is really rough and I'm like whattttttttttt but I'll stop eating groundnut now and get back to my drinking water and fruits therapy nice blog thisreally helped me.